While growing up, going to college, and working in a rural area I knew what it was like to have decreased access to care. I thought I knew what I was walking into when entering Health Partners Free Clinic, but in reality, my expectation was nowhere near what is truly behind the doors of the clinc. On my first day at the clinic I was expecting to walk into the clinic, counsel patients on medications and disease-state and go on. I was unaware of the amount of passion every volunteer and staff member has for each individual patient that enters the Clinic. Each patient can meet with a primary care physician, have blood drawn, speak with a pharmacist and seek further specialty care if needed. The staff and volunteers all have one common goal and will do their best to have each patient walk out with satisfaction that their health care is in good hands and more importantly someone who cares. Health Partners is more than a job or a volunteer opportunity for each staff member. They are working to take care of a patient mentally, physically and emotionally. My month at the clinic flew by and I am thankful that I was able to be apart of such a great team. Not only did I gain experiential knowledge but also patient care knowledge. Every year in school we are taught to look at the patient holistically and not just their lab results over and over again. Being at Health Partners has solidified this for me and showing me how to take care of a patient as a whole. This experience will help me grow professionally so that I can take care of each of my patients as a pharmacist in the near future. Not only do I feel like I have touched lives, but the patients have touched me. I will most likely never see any patient I spoke with over the course of the month, but they have taught me so much about how to care for a patient and to look at their main concern. This concern could be the loss of a loved one, the loss of a job, or having a disease that puts a burden on every day activities. The patients have taught me that compassion is one of the most important things to have when helping my patients. Not only will the clinical knowledge I have learned from HPFC advance with me as I continue to grow as a pharmacist, but so will the ability to take care of a patient holistically. I have learned that sometimes managing a disease state such as diabetes or high blood pressure can be simpler if you just listen to what each patient has to say. I appreciate this great opportunity at HPFC and hope that every student after me will feel the same way. Experiences like mine at Health Partners Free Clinic are far and few between. This month made me remember exactly why I got into health care – to provide compassionate care to patients. The team at Health Partners Free Clinic has built an extremely unique model of healthcare delivery. 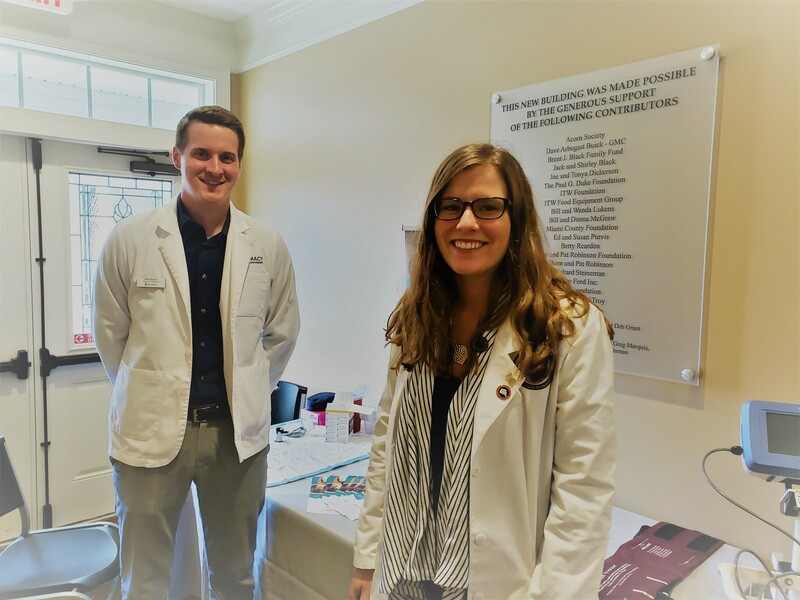 They have created a one stop shop for patients to come in, be seen by a doctor, have bloodwork done, sit down with a pharmacist and review their medications. Patients do not have to drive to a laboratory to have their blood work done, then to their pharmacy to pick up their medications – it is all done in house. Not only is this all done in house, but also it is free of charge to patients who otherwise would not have access to health care services. This model is unique and patient’s really seem to enjoy the system. At a fundraising event, we were talking to a gentleman and explaining what all we do. 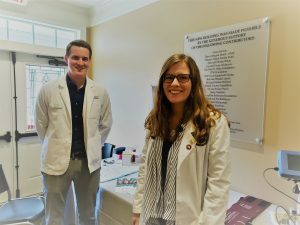 Justin explained the services that were offered at Health Partners Free Clinic and the man stated, “that sounds great, unfortunately I have insurance.” This was the moment that it hit me – we’re providing a better service to patients in a more efficient manner than most doctor’s offices or clinics. This month has been filled with amazing patient interactions. The patients at Health Partners Free Clinic are all so grateful for the services that are provided that they are very respectful and receptive to us. The impact that we are able to make on the underserved is phenomenal. I remember reading about one patient in particular that came in, the patient was a diabetic, had high blood pressure, high cholesterol, and was a smoker. We discussed so many things with them and calculated a risk score stating that they had a 30% chance of having a heart attack or stroke in the next 10 years – they were in their late 40s. This must have been their wake up call because after this discussion they came back and I was able to talk with them about things. All of their numbers had improved and they were starting to lose weight. This patient was cutting back on smoking and their diet and exercise had improved. At Health Partners Free Clinic there is an emphasis placed on getting to the root cause of an issue. As health care providers, we can mask symptoms all day but unless we get to the root of the issue there is not going to be as meaningful of a change made. This patient focused on improving their diet which was lackluster at best and they had completely turned things around. This month has been full of experiences like this. It seems anymore that health care is focused on quotas and timeliness when in fact it should be more focused on time with the patient and compassionate care. I was able to experience that this month at Health Partners Free Clinic. It was a refreshing month and I was able to remember exactly why I got into health care.